No idea why - he'd never get in it. Too late. Scott has gone to the dark side of Mazda ownership, carpet slippers, pipe and queueing for pensioners discount day at the local chippy. At least us affros have stuck with the turnip munchers finest offerings. MX VIP day for me on Sat at North Berwick, free lunch and 2 hour test drive. I'll give you update on the latest 4th Gen 5, the ND. Seems by the rumour mill its underpowered and BBR working on a turbo as usual. Muley, there was a S1 Elise for sale 2 miles for me, cheap price. I sat in it and decided I need a car with regular sills, why don't Lotus just build a series 3 élan, there will be Fiat 124 Spyder and Alfa Spyder spin offs of the ND. why don't Lotus just do that but fit a Cosworth or BBR straight from the factory, 250bhp, £30K retail, they would fill their showrooms. Scott J wrote: Muley, there was a S1 Elise for sale 2 miles for me, cheap price. I sat in it and decided I need a car with regular sills. Whats wrong with the high sills Scotty?, Its not that bad you get used to them really quick and develop a technique for in / out, poor excuse man , keeps you fit as well!. Far better off with high sills than ones made from bottom grade steel rotting rapidly from the inside at lightning speed . Jamie N wrote: Far better off with high sills than ones made from bottom grade steel rotting rapidly from the inside at lightning speed . Are they really that bad Jamie ? 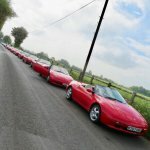 It's a well documented issue with MX5's Mark, most mass produced cars are going to suffer corrosion obviously but the Mazda seems to be a lot worse for it than some, again its going to depend on how / where its owned, as well and how fastidious the owner is at keeping the dreaded tinworm at bay but going by most accounts it needs rigorous and regular treatment if you want to preserve it properly for a good few years, otherwise chances are you will end with more bubbles than a box of Nestle Aero before long. I have a relative with a 4 year old one, not a daily driver and kept garaged, both arches and sills already starting to blister quite badly. The front chassis rails also suffer from serious corrosion issues and needs plenty of rustproofing injection. I still quite like them though, had 3 or 4 over the years including the JDM Eunos Roadster, fun wee cars if you can find a good one, no matter what though, no MX5 on the planet could come close to an M100 for such stunning design and exclusivity, to my eyes anyway. The other day i did a run of about 100 miles round Central Scotland in the Elan and was amazed at the attention it got from other drivers and even pedestrians, still such a phenomenally pretty and headturning car to this day, but the one thing i also noticed, most MX5 drivers look the other way with an expression of "s**t, i've just been PWNED . THE DARK SIDE - I've always fancied myself as Darth Vadar, black beastie was my death star terrorising the Trossachs..
Jamie, had mine on ramps a few times, its 8 yrs 75000 now. Can't see any rust anywhere. Car came from darn sarf and I keep it mostly garaged. There is an issue with the soft tops getting blocked rear drains and the sills fill like submarine ballast tanks, doesn't apply to the Coupes. Fingers crossed anyway.